For the first time in the history of the automobile, the concept of the electric vehicle has made genuine progress into mainstream viability. Range is at an all-time high, and the infrastructure to keep them charged is more accessible than it has ever been. However, the truth remains that once the car’s battery is fully depleted, you’re immobile on the side of the road, and the few gallons of gas the friendly road ranger has in the truck isn’t going to help. If you do make it to the next charging station before that happens, you’re stuck there for an hour at best, if not three or four hours. That time spent waiting for your car to charge is intolerable if you have a stomach rumbling for food and a phone buzzing with an angry boss on the other end. That’s why, in the grand scheme of things, electrified cars (hybrids included) still occupy a tiny percentage of the overall American new car market, from 1% to 8% depending on who you believe. It seems then that plug-in hybrids are the solution for the time being. They have externally chargeable battery packs with more capacity than those in a conventional hybrid, which can allow most people to run short errands like the commute to and from work and a stop at the grocery store on electricity alone. But, they also have internal combustion engines that can go further abroad if necessary, that can be refueled just as easily and quickly as a conventional car. 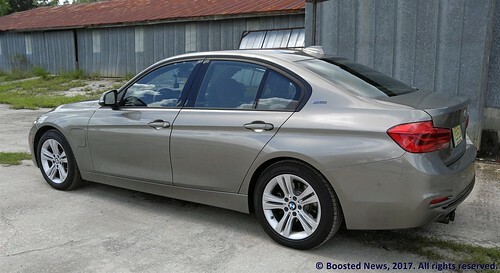 Enter the BMW 330e, the Munich luxury automaker’s take on the plug-in hybrid concept. 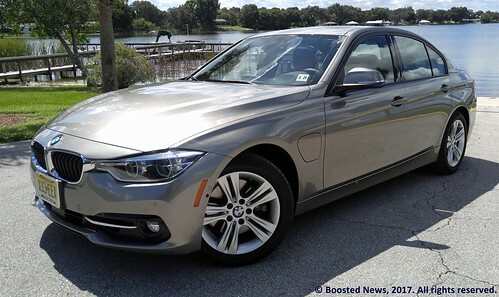 The 330e begins as a 320i, so, right off the bat, it’s a terrific car. 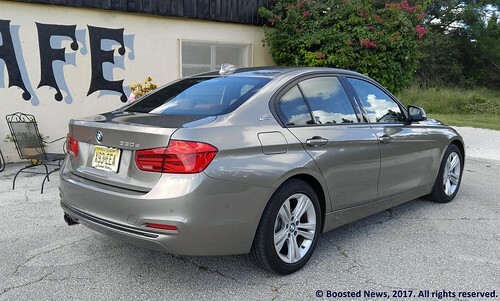 It uses the same 2.0L turbocharged, intercooled, and direct injected 4cyl engine with the same 180hp, but the 330e’s engine gets an additional 15 ft-lbs of torque on top of the 320i’s 200 ft-lbs. Taking the place of the torque converter in the 8-speed ZF automatic transmission is an electric motor which produces 84hp and 184 ft-lbs. BMW claims the total output of the entire powertrain is 248hp and 310 ft-lbs of torque. 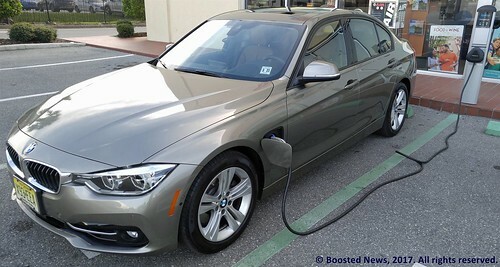 This makes the 330e a quick car and a speed demon of a plug-in hybrid. Like any other BMW, the Sport button next to the shifter tightens up the suspension and speeds up the shifts in the transmission, and pushing it twice enables Sport Plus mode which partially deactivates the traction control. But in the 330e, it keeps the gasoline engine running permanently, so it and the electric motor can combine their forces and get the 330e to 60mph in 5.9 seconds and onto a top speed of 130mph, according to BMW. When the time comes to be more sensible, the driver has three options, chosen this time by the eDrive button which is also right next to the shifter. Auto eDrive will first use up the charge in the battery and then activate the gasoline engine as needed, like any other hybrid car. Max eDrive is electric mode only. As long as there’s charge in the battery, the 330e will not use the gasoline engine for any reason other than full throttle application, and the top speed will be limited to 75mph. Then, and this is a much appreciated feature, there is a Save Battery mode. The gas engine will become the primary method of propulsion, and if the battery has more than 50% charge, the 330e will retain it for later use in full EV mode. If the battery has less than 50% charge, it will use regeneration and excess power from the engine (when it’s cruising at a constant speed or sitting at a red light, for example) to charge the battery up to 50% power. It’s ingenious because the 330e is the only plug-in hybrid car I’ve ever driven that will self-sufficiently charge itself up. It added 9 miles of range to itself during one of my stop-and-go trips across town during rush hour. It’s one thing for a hybrid car to capture remaining kinetic energy. It’s quite another for a hybrid car to photosynthesize. However, your results may vary. The 330e once read on the gauge cluster that it could do 23 miles on electric power, but your driving style and heavy use of the HVAC system can impact that number substantially. Setting the cruise in Max eDrive at 64mph only got me 14 miles before the gas engine took over on one occasion. Whenever I test drive a plug-in hybrid car, I deliberately charge it whenever I can, but only at my own convenience. If I know of a restaurant nearby and a charging station is within a reasonable distance, I will plug the car in and walk to the restaurant so the car can charge while I’m having dinner. Also, if I’m home, the car gets plugged in using the supplied 120V charger. But if plugging the car in doesn’t fit into my plans along the journey, then so be it. With that in mind, I observed 36mpg over the course of the test period with the 330e. Again, your results may vary. The downside is that the 330e does not handle anything like a 320i. The battery pack is located as far back as possible, right underneath the trunk floor. This is good because 51.4% of the total weight is borne by the rear wheels. But there are drawbacks. Trunk space is compromised; 4 cubic feet of it has disappeared compared to the 320i. Finally, the car is heavier. Like, a lot heavier. The battery pack turns the reasonable 3370lb 320i into the porky 3900lb 330e. That’s just a few pounds off the curb weight of the last generation 535i. It may have kept the 320i’s rear-biased sports sedan handling characteristics, but it’s now less enjoyable to experience them. 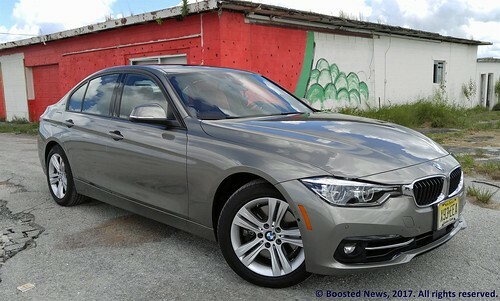 That’s okay, though, because the BMW 330e’s mission is not to be the lively sports sedan from which it originated. The 330e is different. Apart from the eDrive badges on the C-pillars, and the charging door in the driver’s side fender, there’s no indication to onlookers that it’s anything other than a 3-series, which is a very pleasantly designed car as it is. The 330e still makes a statement, but it makes the same statement as its gasoline-only 3-series siblings. Of course, you can use the home charger every night and do your due diligence to save money and conserve energy during the work week, but then you can use the gasoline engine to take you to an upscale beachside restaurant on a Saturday night and step out in style as you hand the keys to the valet, who probably won’t notice the difference, either. It’s discreet about its eco-friendly intentions, but most importantly, it doesn’t require you to make the sacrifices in style and performance other plug-in hybrids do to achieve them. It may be a plug-in hybrid, but it’s still very much a BMW.